In a blender/mixie jar, add grated or crumbled paneer, mawa or milk powder, sugar and pulse it for few seconds. Then heat non-stick pan, add butter or ghee when its melted add ground paneer-mawa-sugar mixture. And stir well and cook in medium heat for 10 minutes or until the mixtures turns smooth and starts leaving the sides of the pan. pour the mixture to a greased plate, using a spoon flatten it evenly to a rectangle or square shape. Soon top it with chopped nuts or slivered almonds, press gently. When its still warm slice it. Once it cooled completely remove the slices and serve. 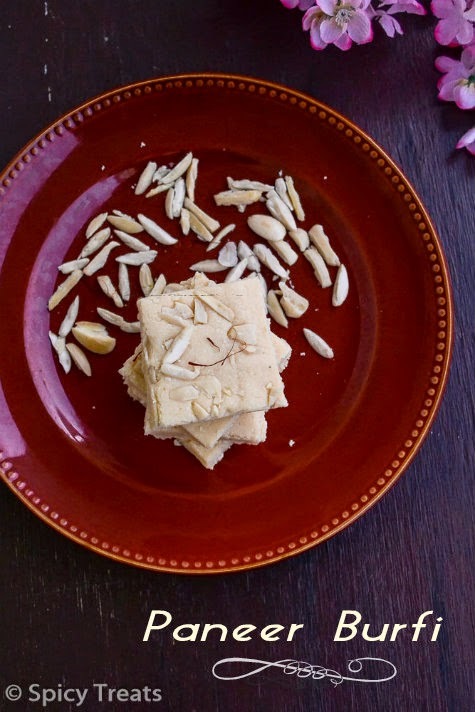 This Paneer Burfi stays good in room temperature for 4 -5 days or you can refrigerate it for 10 days, Once i refrigerated it for 2 weeks in a ziplock. Milk Mawa Powder is availbale in Indian Grocery store. If not, you can use full fat milk powder. Try to Use Fresh Paneer. Cook in low-medium heat, i burnt it little that's why the burfis are slightly brownish. Keep stirring the entire cook time. Use non stick or ceramic pans. 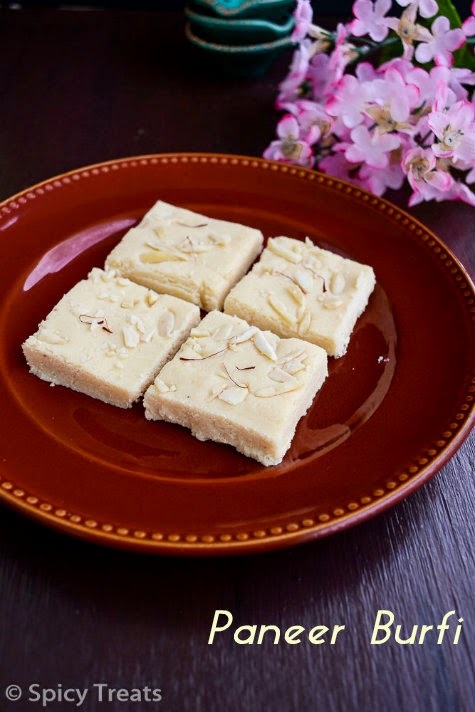 Seems like you are back with a big and god collection of recipes Sangee.. :-) Paneer burfi and a saffron strand on really inviting. BTW, i liked your butter murukku too . Omg,those burfis are alluring, looks like u r back with a bang..Keep rocking Sangee.. 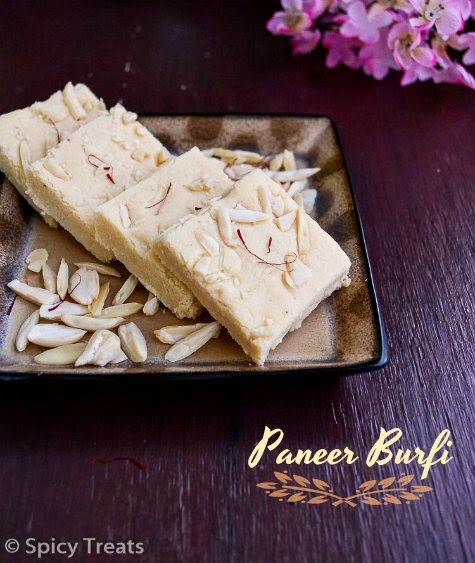 I've had a paneer barfi recipe in my recipe book for such a long time but never tried it. After looking at your photos am tempted to make some for diwali. Please link diwali recipes to the diwali event I am hosting. Thanks. 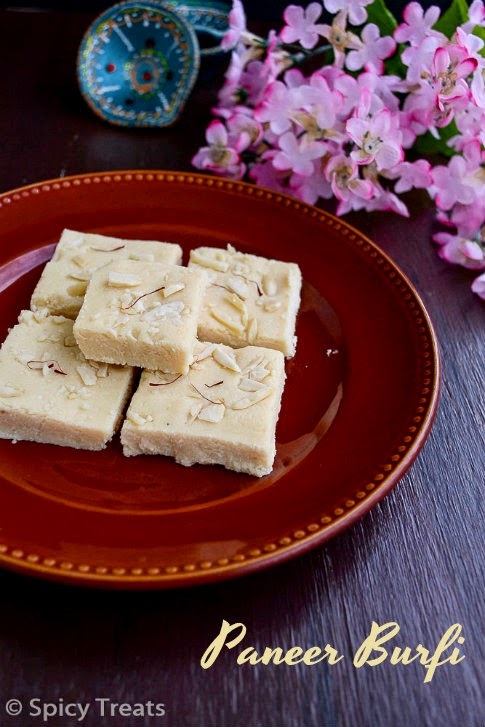 Sooper Sangee.. jus awesome n yummy paneer burfi..
Yummy burfis, they look so very tempting.. Very tempting, I have bookmarked it to try. 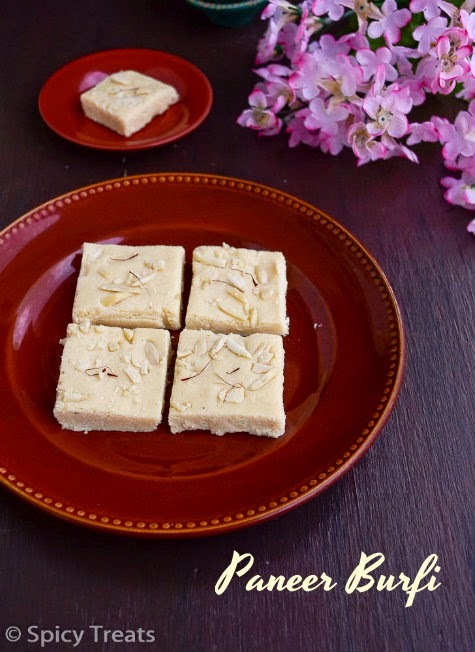 yummy and quick burfi recipe Sangee!! !